Alel was still standing in the porch of his house on John Paul II street even weeks after cyclone Ockhi. The two-year-old smiled at everyone who passed by, and kept looking again and again at the mud path leading to the house, hoping that the next man who came that way might be his father, Yesudas. Some of the houses on the street were decorated with a star and glittering lights. But Ajikuttan (as his family fondly calls Alel) stood in darkness. 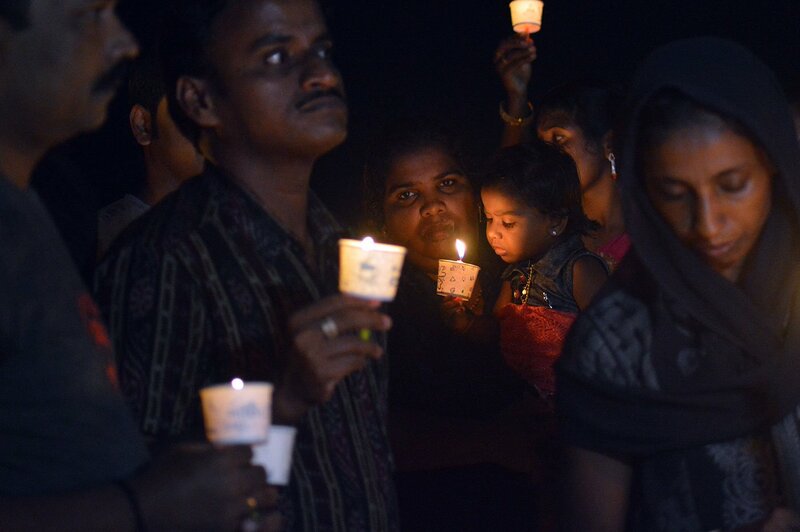 His mother Ajitha, 33, a homemaker, was inside, crying; she had been in bed for days. Every now and then, Ajikuttan would hug her and then return to the porch. Yesudas Shimayon, 38, was one of the fishermen who set out from his three-room house in Karode village of Neyyattinkara taluk in Thiruvananthapuram district of Kerala when the cyclone descended on November 30. He went to the sea in the evening of November 29 along with four co-workers. One of them was his neighbour Alexander Podithampi, 28, three were from Tamil Nadu. Alexander and his wife Jasmin John, 21, have a 10-month-old baby girl, Ashmi Alex. The group usually returned to shore after 6-7 days of fishing. They would then auction the fish and go back to sea the next day. That was their routine. But ‘Star’, their boat, has remained untraceable, with no information received so far. At least 13 fishermen are missing from Pozhiyoor hamlet of Karode, a large village of around 32,000 residents. More than 1,500 fishermen from Kerala and Tamil Nadu had gone to the sea that evening. Their families told the media they didn’t get precautionary warnings from any government agencies about the impending cyclone. 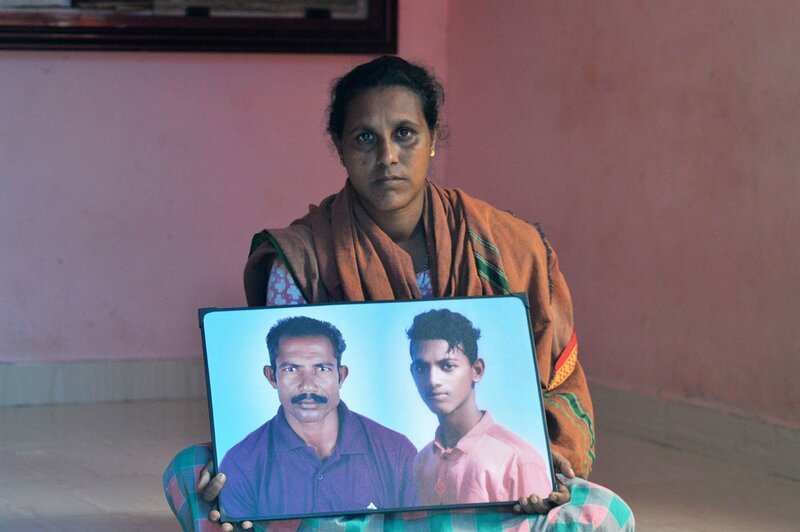 Mable Adima’s husband Shilu, 45, and their son Manoj, 18, are among those missing. They too set out that day, the two always went together on the Vallarpadathamma, a boat that had a wireless set. The boat’s owner, Kejin Bosco, from Paruthiyoor hamlet of Karode village, got messages once on November 30 that the sea was very rough. Then the signal vanished. Search teams later found two dead bodies – companions of Shilu and Manoj – from this boat; they saw other bodies floating in the water but could not recover them because of the rough waves. "We lost the boat, nets and all other equipment in the sea,” Bosco says. “The total loss is 25 lakh rupees. The rescue team couldn't bring the boat back. But the saddest thing is that we lost our friends and the loss of their families is incalculable." Mable has a 15-year-old daughter, Princy, who is studying in Class 10. In addition to her grief about her untraceable husband and son, she is now worried about Princy’s education and about a Rs. 4 lakhs loan the family took to build their house. Ockhi (in Bengali the word means ‘eye’), an intense tropical cyclone in the Arabian Sea, hit Sri Lanka on November 29 before reaching coastal Kerala and Tamil Nadu around noon on November 30. It was especially severe in Kanyakumari district of Tamil Nadu and Thiruvananthapuram district of Kerala, where it also impacted Kollam, Alappuzha and Malappuram districts. “I am afraid of the tide now. I won’t go to the sea again. I can’t,” says Clement Banjilas, 65, his face pale. Clement, a fisherman from Poonthura hamlet of Muttathara village in Thiruvananthapuram taluk, has been out on boats since the age of 12. On November 29, he went to the sea with two others at 3 p.m. The night, he recalls, was calm. But when they were returning to shore around 5 a.m. the next morning, the weather deteriorated, a furious wind started, and their boat suddenly turned over. Clement (who spoke at the Press Club in Thiruvananthapuram) says he snatched a rope from the boat and tied a jerry can to his body to help him float. Despite gigantic waves washing over him and the heavy rain, he survived for about six hours in the sea. Then another boat came by and saved him. The prime minister and Kerala’s Minister of Fisheries J. Mercykutty Amma promised people in the cyclone-affected villages that they will bring the missing persons back home before Christmas. In the operations carried out by the Indian Navy, Coast Guard and the Air Force, more than 800 fishermen were rescued, Defence Minister Nirmala Sitharaman informed Parliament on 27 December – 453 were from Tamil Nadu, 362 from Kerala and 30 from Lakshadweep and Minicoy islands. But the government agencies suspended their search and rescue operations two days before Christmas. When people protested strongly, the search was resumed after December 25 – and it is still going on. According to the Kerala government, 143 persons from the state are missing; the central government says the number is 261. And the Latin archdiocese of Thiruvananthapuram has collected 243 names, while 440 persons from Tamil Nadu are still missing. After Ockhi, the National Fish Workers Forum and the Kerala Independent Fish Workers Federation have given a list of demands to the disaster management team set up by the central government. These include: financial aid and support to bereaved families; financial assistance to fish workers who lost equipment; licensed satellite wireless sets and satellite radios to be distributed to all deep sea fishing vessels; life-saving sea-safety kits and navigational equipment for all fishermen going into the deep sea; marine ambulances for all coastal districts of Kerala and Tamil Nadu; and the participation of fish workers in decisions related to disaster mitigation and rehabilitation. And because of the bitter experience after the December 2004 tsunami – when funds were used inefficiently and without transparency – the funds allocated as part of the Ockhi cyclone relief package should strictly be utilised only for the affected fishing villages of Kerala and Tamil Nadu. Meanwhile, members of various political parties have come and met Yesudas’s family and other families in Karode. They have assured help and offered to support the schooling of Ajikkuttan's sister Aliya, 12, and brother Alan, 9. 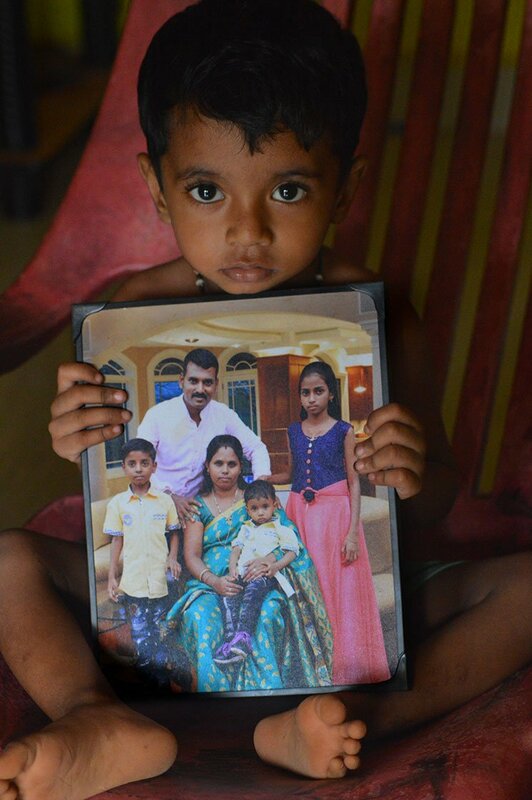 Yesudas’s family still hopes that he and the other fishermen might have safely reached a shore somewhere. And that he will soon come home or phone them. “He has been going to the sea since the age of 15,” says his sister Thaddeus Mary. “He is so vibrant. He knows many languages. He will come back." But when the government declared on December 23 that the search was suspended, the elders in the community advised Ajitha to perform her husband’s last rituals. Reluctantly, she agreed. His rites, along with those of the other missing fishermen of the village, took place at the local St. Mary Magdalene church that day. The family though continues to hope. "We are waiting,” says Thaddeus Mary. “We will wait for him a few more days." A version of this story was published in Madhyamam on December 24, 2017.